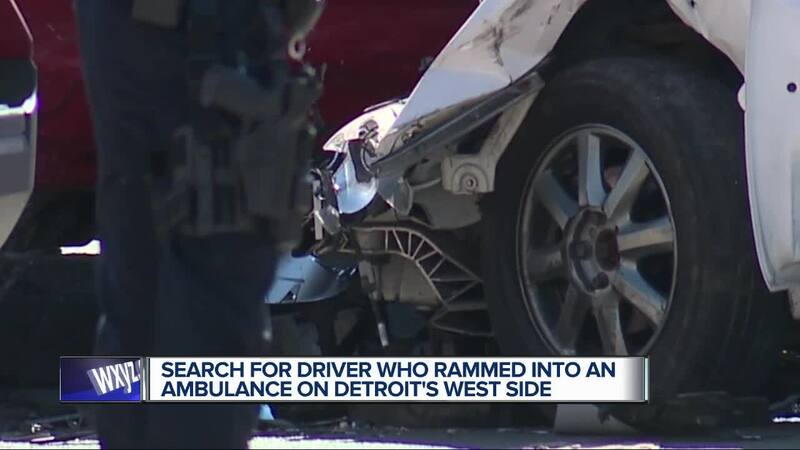 DETROIT (WXYZ) — Two emergency medical services workers and two others were rushed to a hospital Saturday after a car slammed into an ambulance on Detroit's west side. Police say the crash happened at the intersection of Lyndon and Schaefer. According to police, all four people, including a child, are in stable condition and expected to be okay. Around 1 p.m., officers were called to the scene. Police say the ambulance was heading to a scene with its lights and siren on when the suspect vehicle hit the side of the ambulance. "Everybody stopped, just this guy never stop," said a witness. The witness told Action News he saw a good Samaritan open the door of the car that slammed into the ambulance to help the driver. But the driver got out of the car and ran off from the crash down an alley. Police say the suspect left behind a female passenger and a young child in the damaged vehicle. A suspect description has not been released yet. The case is now being investigated as a hit and run.